Bring the beauty of spring and summer into your home with the Colors of the Wind Afghan. This beautiful crocheted afghan pattern would look great in any room in your home, and it's a fun way to play around and experiment with color. The unique shape and flow of this afghan also helps to add a wonderful texture and makes it a great accessory for a bed or couch. Use the colors listed in the pattern or create your own unique design by selecting yarn colors that match your own home decor. Gauge: 1 pattern repeat, 18 sts = 6” (15 cm); 6 rows = 4¼” (11 cm). Back post double crochet (BPdc): Yarn over, insert hook from back to front to back again around the post of next st, yarn over, draw yarn through, [yarn over, draw yarn through 2 loops on hook] twice. Front post double crochet (FPdc): Yarn over, insert hook from front to back to front again around the post of next st, yarn over, draw yarn through, [yarn over, draw yarn through 2 loops on hook] twice. You can make throw as large as you wish by making more motifs. Color Sequence: Work in the following color sequence: 2 rows each of *A, B, C, A, B, D, A, B, E; repeat from * throughout, ending with 2 rows A. Row 1 (right side): Dc in 4th ch from hook, *dc in each of next 6 ch, skip next ch, dc in each of next 2 ch, skip next ch, dc in each of next 6 ch**, 2 dc in each of next 2 ch; repeat from * across ending last repeat at **, 2 dc in last ch, turn—8 pattern repeats. Row 2: Ch 3 (counts as dc, here and throughout), dc in first st, *dc in each of next 6 dc, skip next dc, BPdc around each of next 2 dc, skip next dc, dc in each of next 6 dc**, 2 dc in each of next 2 dc; repeat from * across, ending last repeat at **, 2 dc in last dc, turn. Fasten off. Row 3: With right side facing, join B with a slip st in first st, ch 3, dc in first st, *dc in each of next 6 dc, skip next dc, FPdc around each of next 2 dc, skip next dc, dc in each of next 6 dc**, 2 dc in each of next 2 dc; repeat from * across, ending last repeat at **, 2 dc in last st, turn. Row 5: With right side facing, join C with a slip st in first st, ch 3, dc in first st, *dc in each of next 6 dc, skip next dc, FPdc around each of next 2 dc, ch 1 (slip st, [ch 5, slip st] 3 times) around last FPdc worked, ch 5, (slip st, [ch 5, slip st] 3 times) around previously worked FPdc (flower completed), skip next dc, dc in each of next 6 dc**, 2 dc in each of next 2 dc; repeat from * across, ending last repeat at **, 2 dc in last st, turn. Row 6: Ch 3, dc in first st, *dc in each of next 6 dc, skip next dc, 2 dc in center of flower, skip next dc, dc in each of next 6 dc**, 2 dc in each of next 2 dc; repeat from * across, ending last repeat at**, 2 dc in last st, turn. Fasten off. Row 7: Join A with a slip st in first st, ch 3, dc in first st, *dc in each of next 6 dc, skip next dc, FPdc around each of next 2 dc, skip next dc, dc in each of next 6 dc**, 2 dc in each of next 2 dc; repeat from * across, ending last repeat at**, 2 dc in last st, turn. Rows 8–74: Maintaining color sequence as established, repeat Rows 2–7 for pattern ending with Row 2 and A. Do not fasten off. Working across top edge with A, ch 1, (sc, ch 3, sc) in first st, (sc, ch 3, sc) in next st, [skip next st, (sc, ch 3, sc) in next st] twice, *skip next 2 sts, (sc, ch 3, sc) in next st, skip next 2 sts, [(sc, ch 3, sc) in next st, skip next st] 6 times, (sc, ch 3, sc) in next st; repeat from * 7 times, skip next 2 sts, (sc, ch 3, sc) in next post st, skip next 2 sts, [(sc, ch 3, sc) in next st, skip next st] 3 times, (sc, ch 3, sc) in last st, working across side edge of Throw, (sc, ch 3, sc) in each row-end dc across, working across opposite side of foundation ch, (sc, ch 3, sc) in first ch, [skip next ch, (sc, ch 3, sc) in next ch] 3 times, *[skip next 2 ch, (sc, ch 3, sc) in next ch] twice, [skip next ch, (sc, ch 3, sc) in next ch] 6 times; repeat from * across, ending last repeat at **, skip next 2 ch, (sc, ch 3, sc) in next ch, [skip next ch, (sc, ch 3, sc) in next ch] 4 times, (sc, ch 3, sc) in last ch, working across side edge, (sc, ch 3, sc) in each row-end dc across; join with a slip st in first sc. Fasten off. 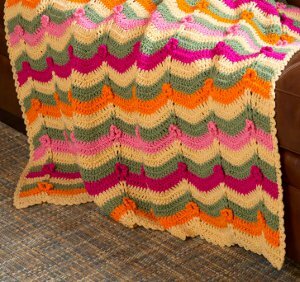 Here is a classic looking ripple style afghan made to be used and loved! It has quite an inventive color combination- I actually would not have thought to put all those pinks together with a pumpkin color, but it works. There is a twist in the pattern to add extra interest.